Once upon a time, a long, long time ago, on the night before Christmas, a little child was wandering all alone through the streets of a great city. There were many people on the street, fathers and mothers, sisters and brothers, uncles and aunts, and even grey-haired grandfathers and grandmothers, all of whom were hurrying home with bundles of presents for each other and for their little ones. Everyone was scurrying around, filled with excitement because tomorrow was Christmas! But the little child seemed to have no home, and wandered about listlessly from street to street. No one took any notice of him except perhaps Jack Frost, who bit his bare toes and made the ends of his fingers tingle. The north wind, too, seemed to notice the child, for it blew against him and pierced his ragged garments through and through, causing him to shiver with cold. Home after home he passed, looking with longing eyes through the windows, in upon the glad, happy children, most of whom were helping to trim the Christmas trees for the coming morrow. "Surely," said the child to himself, "where there is so must gladness and happiness, some of it may be for me." So with timid steps he approached a large and handsome house. Through the windows, he could see a tall and stately Christmas tree all lit up. Many presents hung upon it. Its green boughs were trimmed with gold and silver ornaments. Slowly he climbed up the broad steps and gently rapped at the door. It was opened by a large man-servant. He had a kindly face, although his voice was deep and gruff. He looked at the little child for a moment, then sadly shook his head and said, "Go down off the steps. There is no room here for such as you." As the child turned back into the cold and darkness, he wondered why the footman had spoken thus, for surely, he thought, those little children would love to have another companion join them in their joyous Christmas festival. But the little children inside did not even know that he had knocked at the door. The street grew colder and darker as the child passed on. He went sadly forward, saying to himself, "Is there no one in all this great city who will share the Christmas with me?" Farther and farther down the street he wandered, to where the homes were not so large and beautiful. There seemed to be little children inside of nearly all the houses. They were dancing and frolicking about. Christmas trees could be seen in nearly every window, with beautiful dolls and trumpets and picture-books and balls and tops and other dainty toys hung upon them. A little girl came to the window and looked out into the dark street where the snow had now begun to fall. She saw the child, but she only frowned and shook her head and said, "Go away and come some other time. We are too busy to take care of you now." …Back into the dark, cold streets he turned again. The wind was whirling past him and seemed to say, "Hurry on, hurry on, we have no time to stop. 'Tis Christmas Eve and everybody is in a hurry to-night." Again and again the little child rapped softly at door or window-pane. At each place he was refused admission. The hours passed; later grew the night, and colder grew the wind, and darker seemed the street. Farther and farther the little one wandered. There was scarcely any one left upon the street by this time, and the few who remained did not seem to see the child, when suddenly ahead of him there appeared a bright, single ray of light. It shone through the darkness into the child's eyes. He looked up smilingly and said, "I will go where the small light beckons, perhaps they will share their Christmas with me." Hurrying past all the other houses, he soon reached the end of the street and went straight up to the window from which the light was streaming. It was a poor, little, low house, but the child cared not for that. The light seemed still to call him in. From what do you suppose the light came? Nothing but a tallow candle which had been placed in an old cup with a broken handle, in the window, as a glad token of Christmas Eve. There was neither curtain nor shade to the small, square window and as the little child looked in he saw standing upon a neat wooden table a branch of a Christmas tree. The room was plainly furnished but it was very clean. Near the fireplace sat a lovely faced mother with a little two-year-old on her knee and an older child beside her. The two children were looking into their mother's face and listening to a story. She must have been telling them a Christmas story. A few bright coals were burning in the fireplace, and all seemed light and warm within. The little wanderer crept closer and closer to the window-pane. So sweet was the mother's face, so loving seemed the little children, that at last he took courage and tapped gently, very gently on the door. The mother stopped talking, the little children looked up. "What was that, mother?" asked the little girl at her side. "I think it was someone tapping on the door," replied the mother. "Run as quickly as you can and open it, dear, for it is a bitter cold night and no one must be left out in the cold on our beautiful Christmas Eve." The child ran to the door and threw it wide open. The mother saw the ragged stranger standing without, cold and shivering, with bare head and almost bare feet. She held out both hands and drew him into the warm, bright room. "You poor, dear child," was all she said, and putting her arms around him, she drew him close to her breast. "He is very cold, my children," she exclaimed. "We must warm him." "And," added the little girl, "we must love him and give him some of our Christmas, too." The mother sat down by the fire with the little child on her lap, and her own little ones warmed his half-frozen hands in theirs. The mother smoothed his tangled curls, and, bending low over his head, kissed the child's face. She gathered the three little ones in her arms and the candle and the fire light shone over them. For a moment the room was very still. Then the little girl said softly to her mother, "May we not light the Christmas tree, and let him see how beautiful it looks?" "Yes," said the mother. With that she seated the child on a low stool beside the fire, and went herself to fetch the few simple ornaments which from year to year she had saved for her children's Christmas tree. They were soon so busy that they did not notice the room had filled with a strange and brilliant light. They turned and looked at the spot where the little wanderer sat. His ragged clothes had changed to garments white and beautiful; his tangled curls seemed like a halo of golden light about his head; but most glorious of all was his face, which shone with a light so dazzling that they could scarcely look upon it. With a sweet and gentle smile the wonderful child looked upon them for a moment, and then slowly rose and floated through the air, above the treetops, beyond the church spire, higher even than the clouds themselves, until he appeared to them to be a shining star in the sky above. At last he disappeared from sight. The astonished children turned in hushed awe to their mother, and said in a whisper, "Oh, mother, it was the Christ Child, was it not?" And the mother answered in a low tone, "Yes." 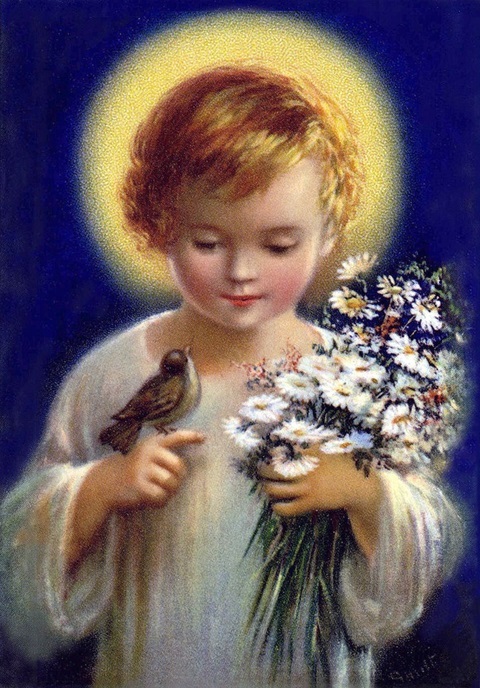 And it is said, dear children, that each Christmas Eve the little Christ Child wanders through some town or village, and those who receive him and take him into their homes and hearts have given to them this marvellous vision which is denied to others.